Report written by Exmouth Colt Ben Tew. 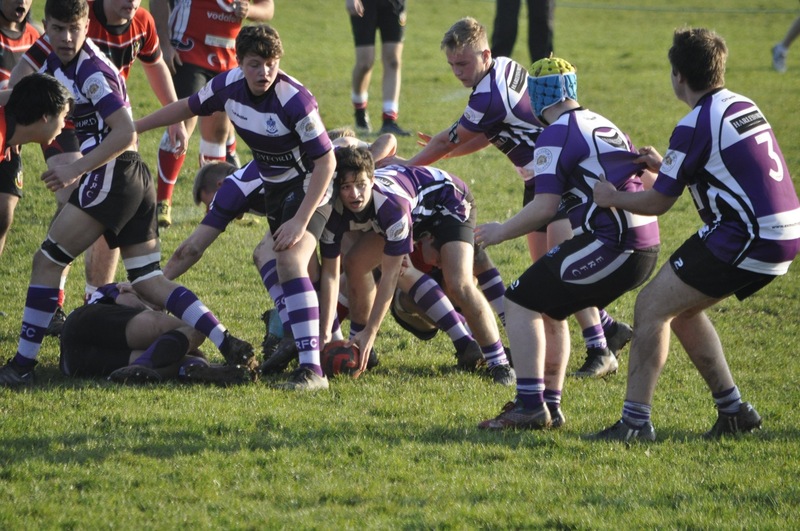 Throughout the contest, despite missing a number of key players – and being forced to start with only 14 – Exmouth showed great heart and determination in defence. Things became even tougher for the young Cockles when right winger Korben Gillman went down with a serious looking back injury, at which point what remained of the first half was cancelled as the teams waited for an ambulance to attend the stricken player who, thankfully, was ultimately found to be OK! Exmouth came out firing in the second half with the forwards stopping any Tiverton momentum by smashing them back in the tackle during the pick and go. In what were testing conditions, Exmouth’s line-outs held strong, even stealing a few from their opponents. Eddie Ford proved to be alert when Tiverton overthrew the ball and, when he smacked it down to an unsuspecting Steward Masters, the latter dealt with the situation very well, diving on the ball to stop a counter-attack. The move for the opening Exmouth try began deep in their own half when they won a penalty for Tiverton being offside. Thomas Pengilley then kicked the ball downfield to get Exmouth to within 40 metres of the Tiverton line, where Jack Briggs supplied Jamie Hacker a superb lineout ball that was thrown straight to the scrum-halves’ hands and swiftly moved into the backs. That was followed by excellent carrying from Ben Tew and Macauley Couch, driving Exmouth to within striking distance, followed by a lovely dummy by Tom Pengilley to take the fly-half over the try line. Unfortunately, the kick was missed, but Exmouth closed to within two points of the hosts. Exmouth were then defending for most of the second half, but their persistence paid off, as they pushed Tiverton to make a mistake which Owain Brinkworth pounced upon and ran the full length of the pitch to score Exmouth’s second try - a real captain’s contribution! A special mention to Owain Brinkworth for starting the game at open-side flanker, holding up two tries and putting in an outstanding individual performance and to Macauley Couch for being a demon in defence and repelling a raid of no fewer than three Tiverton players on his own, and also to Jamie Hacker for scrummaging well in the muddy conditions – he simply did not miss a single tackle and was richly deserving of the Man of the Match award.